Prescription drug misuse represents “a major public health threat” in North America, and Canada is burdened with the second-highest prescription opioid consumption rate worldwide, just behind the United States, the International Narcotics Control Board reports. Prescription drugs are highly addictive, but regularly used in treating acute pain. Nevertheless, evidence supporting their use is disputed, and many say they come with potential for harm that exceeds the benefits. Experts have suggested that the health care community and the federal agency that oversees it should do more to regulate the drugs themselves, and the uses that they are approved for. As well, many physicians are requesting assistance to safely prescribe opioids for their patients. In an attempt to help, Toronto-based ‘med-tech’ start-up CognisantMD has combined mobile technology, cloud-computing and a desire for improved patient care to offer a series of digital tools for physicians and health care practitioners who prescribe, or whose patients request, opioids. CognisantMD builds, hosts and shares a wide variety of digital and online tools for use by medical practitioners, and its core executive team represents a cross-section of technical and medical skill sets. CognisantMD develops a wide range of medical applications for mobile and cloud based platforms. Founder Doug Kavanagh, for example, is a family doctor and physician, and he is a software engineer who specializes in electronic medical records development and clinical e-content. President Jeff Kavanagh has spent the last 15 years in the enterprise software industry, building and running Internet-based hosted software (i.e. “cloud-based software-as-a-service”). The company has now released a series of flowcharts, information sheets, medical forms and patient questionnaires that are filled out using a touch screen tablet in the doctor’s office or online from the patient’s home via a secure online Web portal. 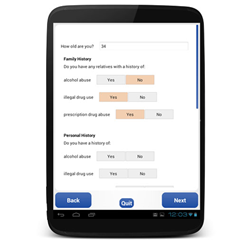 CognisantMD’s prescription drug app ask questions of doctors and patients. 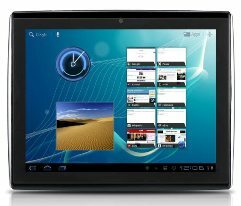 Patients are encouraged to use Wi-Fi compatible tablets with large size screens (nine inches or more), running Android 4.0.4 or higher. CognisantMD offers free downloads from its library of application, used used on what it calls OceanWave patient tablets and TELUS PS Suite Electronic Medical Record (EMR). The opioid management toolkit was released as the provincial Ministry of Health announced a $3.6 million fund to support the appropriate prescription of commonly abused prescription drugs, including opioids. The Opioid Management Toolkit was developed in accordance with McMaster National Pain Centre’s Opioid Manager and the “Canadian Guideline for Safe and Effective Use of Opioids for Chronic Non-Cancer Pain”. Other provincial agencies have used online technology to deliver educational material, such as the College of Physicians and Surgeons of Alberta, about prescription opioids, and have launched programs like Prescription Prescribing Practices Program with information and support about opioid prescriptions.